Whoever said “there are only so many hours in the day” definitely doesn’t work in public relations. Our work is 24/7 and then some, when a major announcement or event is planned. 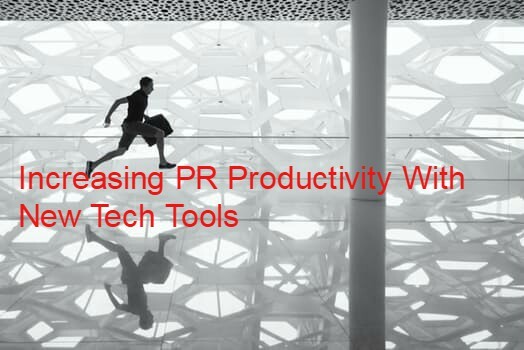 So we thought it was time for a look at some new tech tools and apps to help our industry find more effective ways to save time and increase productivity. Master time management with the Pomodoro Timer app. The app is based on the theory that we work best 25 minutes on and five minutes off. This method has been shown to help people focus, break down tasks more efficiently and most importantly, help prevent creative burnout. Just set the timer and go about your business. The New York Times takes the strategy one step further by advising what to do with your five-minute breaks. Because we can all improve our writing. Check your work with After the Deadline. It goes beyond simple spell and grammar checks that offer technical corrections that are out of context or even wrong. After the Deadline can detect misused words and promises “contextual” spelling corrections and more sophisticated grammar and style checks that should cut editing time and improve our work. Want to get closer to your contacts? Rapportive adds LinkedIn mini-profiles to people you’re connecting with, right in your inbox. You can learn more about where they work, what they do and who you know in common. This one-stop approach allows you to quickly and knowledgeably make contact, and yes, establish rapport. Be a better blogger with Feedly. Having trouble coming up with timely topics and content that crackles? Let Feedly scour the Web for your particular pre-selected subject matter and “feed” you ideas you can use. It’s so much more than a Google alert because it improves your grasp of what’s out there across several mediums. Now that you have all kinds of wonderful topics to write about, if you need some help coming up with catchy names, you can always feed those topics into this tool from Hubspot. Manage multiple social media accounts from a single “compose box” with Sendible. If Hootsuite, bitly, and Mention had a child, it would be Sendible. The site allows you to create and publish posts in advance – including photos and video on Facebook, Twitter, Google+, Pinterest and blogging sites, from one dashboard. It even shortens the links for you. Sendible supports over 20 platforms and boasts a sophisticated prospecting tool to help connect to and convert leads. Get a handle on your social media with Self-Control. Not surprisingly this app was created for college students, but PR people love social media as much as anyone (maybe more since it is actually part of our job description to master the platforms for agency and client work.) This app allows you to block everything except text and calling on your phone for a set amount of time. We suggest giving it a test drive for an hour or so to see how productively you can fill up that time. Employ Siri, Cortana and Alexa at the office to knock off some of your to-do list. You probably already dictate emails to a digital assistant, but you can also automate tasks. For example, you can set up alarms, notifications, location reminders and even when you want the office coffeemaker to go on. If you’re not thrilled with other services that we’ve discussed before to handle your social media posting, you can assign that task as well. Assign the digital helpers traffic estimates, directions to meetings and making travel and restaurant reservations. All are not created equal, however, as this article points out. Tweet more robustly with Twibble. Save time and gain more followers by adding RSS feeds to Twitter, from virtually any source, easily and quickly. Twibble embeds photos and videos ( which most reviewers rave about.) Check it out to see if it lives up to its promise to make you much more interesting to your followers and potential followers. Need an elusive email address? Game the system with Email Hunter. There are few things more frustrating than attempting to make contact with a company CMO or a particular journalist whose email is somehow a state secret. We all have tricks to locate emails, but none are foolproof and they all take time. Email Hunter promises to cut time and effort by providing the “most common email pattern,” plus additional info like phone, title and the contact’s other social networks. Know your contacts before you reach out to them with CrystalKnows. Once you get over the slightly creepy Big Brother vibe, CrystalKnows might actually help you better hone and personalize your communications style with different individuals. Using its DISC (Dominant, Influencing, Steady, Calculated) assessment tool, you gain personality insights into individuals at companies you want to work with or journalists you want to pitch. Simple, subtle changes to emails, for example, can help you connect more meaningfully. At the very least, it’s a fun and enlightening exercise.